Pink is my mom's favorite color and of course, for a while, that meant I needed to dislike it (at least as a teenager). But now I think I am converted. I have most of my fabrics sorted by color and my pink pile is easily the biggest. The above picture shows some recent pink acquisitions: Pretty Please by Jennifer Paganelli, Midwest Modern by Amy Butler, and Good Folks by Anna Maria Horner. Fabric Friday is coming early due to the fact that I am leaving early tomorrow morning to go to the first Boston Modern Quilt Guild retreat! It honestly feels like I am a kid waiting for Christmas - I am looking forward to spending so much time with my friends, sewing galore, and a teensy bit of fabric shopping. This post has got to be short - I have a ton to do to get ready. I made a "moon" pillow for my son on Friday. It's the only thing that I have made him which he actually likes - forget about the 4 quilts, 4 whales, elephant, and sock monkey - who knew I just needed to sew a circle on a pillow to make him happy? (For some reason, this child is OBSESSED with the moon - forcing his father and I to study our local lunar cycle). Just kidding, this is a WIP I bought a few years ago at a quilting yard sale for $5. Considering Gregory's current love for the solar system, I thought it might be nice to put together for him. Finally, I can show the last of my completed UFO's. Around Thanksgiving 2010 - I realized I was drowning in 12 unquilted quilt tops and I decided to fix the situation by 1) learning how to quilt on my home machine and 2) taking the long arm quilting class. This black/white/yellow quilt was my oldest UFO. I think I started ironing the washed and wrinkled fabrics when I finally felt somewhat "normal" after giving birth to my son. I made the blocks and let them sit on a shelf over a year ago. I just wasn't excited about the fabrics anymore. This is going to be a wedding present for a family member. I shouldn't have asked the bride what colors she liked - she said "blue and green." I almost died - she said this right when I was in the middle of making my sister's monstrous blue/green quilt - I can't return to that exact color scheme anytime soon. I used my leftover pieces to make the backing. I quilted it at the long-arm rental place but rented the HQ 16 sit-down machine, as I had already basted the quilt and didn't want to undo all of that to long-arm it. It only took me 1.5 hours. I also finally had the courage to make bias binding and was happy with the results. Alice taught us a class on binding for our latest BMQG meeting and I really took a lot home from her lesson. I only have one UFO of those 12 I had mentioned - it's the pink/orange quilt that I started improvisationally piecing, not sure whether I want to make it bigger or just finish it. I was "bragging" to Nick that by finishing all of my UFO's, I had cleared out a whole big cubby space in my fabric storage area (i.e. I have room for more fabric!) and he had to point out that now we have a towering pile of quilts taking up much more space in our bedroom. Too true! Did you hear that Free Spirit is reprinting Flea Market Fancy in January 2011? Last year a petition was started to get the company to reprint - the company initially refused, even with nearly 2000 signatures and prices of yardage repeatedly selling for $40 per yard on ebay. It was released in two segments - beginning about five years ago. Less than two years ago, it's popularity was soaring (probably due to some popular bloggers using it prominently in their projects) - and prices began to rise by resellers. Less than a fat quarter of scraps of "seeds" sold for over $100 on ebay about a month ago. Some people are vowing to buy "bolts" when the re-release hits the market. The mania surrounding this line kind of scares me - and it makes me feel a little uncomfortable to see it growing to be the quilter's "status symbol." But I will admit that I am kind of excited with the prospect of getting more of some of the prints myself. I can't imagine how some people might be feeling if they had bought all of the $10+ fat quarters and now it's coming back to being available at standard prices. These are a few charm squares I received in a swap that I plan to use this week for a small project. Last week I wrote about buying some DS Joann's fabric and was asked by a friend if I worried about buying fabric from Joann's (due to it's reputation for selling bad qualityfabrics). The answer is: YES. In fact, I am famous for "hating" Joann's by some friends. 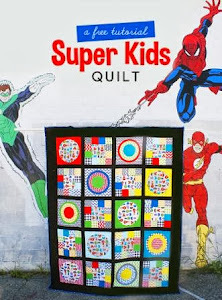 I guess I have been kind of vocal about my preference for "quilt shop quality" fabric and I always try to encourage beginner quilters to avoid Joann's and Wal-Mart fabrics. In general, I very rarely buy fabric at Joann's. I usually just go there for batting, thread, and interfacing. But I have to admit that I occasionally buy some fabrics at Joann's: Kona Cotton Solids (there is some debate about whether it is really released by Robert Kaufman to Joann's, but just check out this post), some Alexander Henry can be found in the novelty section, Lisette apparel fabrics (aka Oliver and S), and now the DS collection. I also should mention that occasionally designer fabrics can be found in the fat quarter bundles (Lizzy House, Heather Ross, Denyse Schmidt, Sandi Henderson, etc.) and rolled up fat quarters- all with their selvages cut off. (Left to right: Farmdale by AH, Modern Floral by DS, Lisette pink twill, Lisette spiral voile). But of course, I have to talk about why 99% of my stash is not purchased at Joann's. I started quilting in high school and used Joann's and Wal-Mart's fabrics exclusively until about 3 years ago (shocking, I know). Sometimes I would hear people say that they "never" buy fabric at Joann's and it came across as elitest/snobby to me. I didn't know why they were so loyal to quilt shop fabrics and assumed that they had money to burn. But in the end, I think you have to make a project out of the chain store fabric in order to really "get" what happens to the quilt over time and why poor quality fabric is not recommended for quilts. I don't have swatches of the original fabrics, but I can tell you that the colors have faded tremendously and it only took a couple years before I noticed a drastic change in the color composition. The fabric is also very thin and worn. Don't get me wrong, I am thrilled that this quilt has seen so much use and I would die of happiness if Gregory made one of his (four!) quilts go into tatters and shreds by too much use. But there is a difference in general wear-and-tear and materials just not lasting. Quilts take too much time and effort to not see them sustain general usage. Allow me to end this long post by pointing out that Joann's prices have really rised recently and it's really not all that cheaper to buy their fabric compared to quilt store quality fabrics. If you put a little extra effort into your fabric shoping and get familiarized with online vendors who offer sales, promotions, and free shipping -I am pretty confident you will end up spending less than you would at a chain store. More bibs.... (boring, I know). To distract you from the boringness of the project I completed last week, I am including some pictures of my son. Better yet, they illustrate the necessity of said project, despite it being mundane. A few weeks ago we allowed Gregory to dive into a small brownie and some ice cream, this is the result. For months, it has been apparent that the bibs I had were just too short. Sure, he'd be clean from about the belly button upwards, but below - sometimes he just needed a new outfit after some meals. I guess I am lucky that he will still tolerate wearing a bib - a lot of kids his age won't. But he is SUCH a messy eater. So I made ten super-long bibs - I wanted to kill myself after the third one. Making the same exact thing over and over is just TOO boring. I will never be one of those sewers who cranks out the same thing repeatedly for an etsy shop or craft fair. I have a lot of respect for those who do, don't get me wrong, but it's just not for me. Here's one of the bibs in action. Look at that cow-lick! Watch out Dennis the Menace! His dad has the same thing. Notice anything similar? Yeah - apparently I have red, yellow, and blue on the brain. I thought about combining them - but the colors and scale are too dissimilar. So here's what I pulled out that seems to match the PG fabrics. I know I need more greens and yellows, less reds probably. Oh so pretty. Tomorrow I am off to MQX (Machine Quilter's Expo) with a friend. I am so ready for a day away! Sometimes you really just have to finish a quilt, binding and all, before you issue your final verdict on it. My Tufted Tweets quilt top sat around for quite a while after completion and I grew to dislike it. My main issue is that I wish I hadn't included any gray in the log-cabin blocks - it just looks a little off to me. I came really close on not investing the money on batting and long-arm rental to finish it. But I went ahead and finished it anyway and I am glad that I did. I really enjoyed doing free-motion stippling. It only took me 2.25 hours to complete the whole quilt. I didn't even have to sit down and eat the lunch I had packed for the day! This is the backing, a Cosmo Cricket print from the collection "Snorkel." Remember when I said that I finished 4 quilts about a week ago? Well, this is the final and fourth quilt that I had completed. On the morning of our most recent Boston Modern Quilt Guild meeting (name change alert!) I took my first (oops!) look at the supplies needed for our binding lesson and realized that my 6" quilted block wasn't going to cut it when we needed something that was at least 9". I reached for one my last "UFO's" (un-finished object) and got to work. I had made this pink and green dresden plate in preparation for my African heart dresden project - and it had sat as a scrunched up ball on my shelf ever since. I think my favorite thing about this mini quilt is that it uses fabrics that go well together without being in the same collection. There is a little bit of Moda Uptown, Modern Meadow, Freshcut, and Wildwood in there. Alice taught us a lovely class on binding. Even though I have been binding quilts for almost two years now, she taught me so much that I didn't know. If you want to know how to do the easy, invisible join method, check out this link. Before I do my fabric Friday segment, I have a few other things on my mind. I spent most of yesterday at Laurena's Longarm quilting studio - I finished two more quilts - woohoo! I will post those soon but couldn't resist showing this picture of my little guy who was literally hurling himself onto his "big boy" blanket when I came home. (I hope this is a good sign that he will actually like this one!) This week I have also been catching up on bee blocks. I don't know how people participate in multiple bees - two is about all that I can handle. I have never been late before - but I did get a bit behind. Monet requested huge spider web blocks for our Boston Modern Quilt Guild bee. She made starting easy with sending precut fabrics. I have to admit that I was really intimidated by this block for some reason but now I am really interested in doing one of these for myself one day. It's hanging on my design wall right now and people who have come over have really loved it - it's a big hit with Nick too. Monet's fabric choices are impeccable . Patchwork Duck (Nicole) asked for simple square in square blocks with batik and bright cottons. I am about a week late with these, so I went ahead and made two. Mary asked that we use the vase fabric as our focus to make a square or a rectangular block of any size. No size requirements made my day - I am SO bad at figuring out the math on even the simplest of blocks. For the first time ever, I cut up one of my son's baby shirts! I was so scared to cut into this darling little button-up shirt, but he's long outgrown it and it's perfect for the little project I am doing for him. When I bought this shirt, I knew I was going to cut it up eventually because the print is SO cute - you can't see it in the picture, but those little spots are teeny tricycles. Even though I love crazy, multi-colored prints, I have been thinking about how I really love simple fabrics too - particularly monochromatic fabrics or simply one color with white. I also love basic fabrics - you all know I love me some polka dots- but when I can find a basic that is not a dot or a stripe - I totally go for it. This was the first quilt I long-armed myself. I thought it would be easiest to start by following a pantograph (there is a laser in the back of the machine that you use as a guide to follow a pattern). Let me tell you that it was pretty tedious work! It took over six hours and I was exhausted by the end. It came out nicely, despite my pain and suffering. I have, however, pretty much decided to stick with free-motion methods from now on. Here is a picture of the back of the quilt. 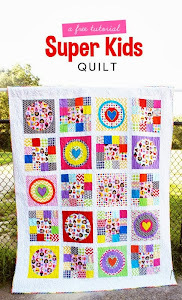 This quilt is the first of many more Pop Garden quilts to be made, I am sure! Man, I have a bit of the Monday blues. The weekend was just too glorious - we had two bright, sunshiney days, great food, and great company. Now it's Monday and it's raining, I have several loads of laundry, and a sink overflowing with dishes. My sister is gone after a two week visit and I am severely missing her. But I really shouldn't be too woeful. I got a TON of sewing done over the weekend and I am thrilled with what I was able to accomplish. I also finally took some better pictures of some recently completed quilts - so lots of good posts are scheduled now. After finishing my HUGE African Dresden quilt top, I rewarded myself by starting a new hand sewing project. The hexagonal flowers I did so many of last year are being put on the back burner for now, so I am starting a small mini quilt for my son (who else?!). It's a really unique idea I have had in my head for almost a year, so I am excited to finally start it. What do you get when you combine 6 yards of wax-printed Nigerian fabric, 13 half yd cuts of various prints and solids, and 8 yards of white Kona? This gigantic quilt top, of course! It measures 90 x 108. There are 30 blocks and 50 hearts appliqued onto the quilt. I cannot wait to finish this. The only dilemma is that I have NO IDEA how to quilt it and I have no idea what to back it with. Suggestions would certainly be welcome. This was definitely Nick's idea to hold this quilt from the roof. It made me a little nervous but it is a fun shot. This quilt was a bit tedious to put together but I think it was well worth it. I am going to rent time on the long-arm machine this week for two other quilts and I plan on scheduling a time to come back and finish this baby as soon as possible.